Programmable thermostats and smart home systems are now available at very low prices. The Nest Learning Thermostat for one of the most simple-to-use, inexpensive alternatives around. It learns the temperatures you prefer without any complicated programming process, it can detect when no ones home and change the temperature accordingly, and it is even remote controllable via Wi-Fi and mobile app. In some areas, home cable companies are now bundling temperature automation and smart home features like remote-controlled lighting, temperatures and security systems and even smoke and carbon monoxide monitors right into the same online dashboard you use to pay your bill or order a movie on-demand. Adding little details can make a home feel custom and filled with character. These little projects can be high in aesthetic impact with a relatively low investment of time and money. A survey by Sunrun revealed that over 40% of Americans believe a solar system cost more than $20,000; and eight out of 10 homeowners said they would install a solar system at home if cost wasn’t a factor. Solar is not for everyone, and not even for every home, but in states with sunny, hot summers and energy bills to boot, installing a solar system can create the double luxury of allowing owners to run the home on renewable energy and reduce energy costs in one fell swoop. The truth is, in some states, cost isn’t a factor. There’s a new generation of companies— solar power service providers— who will pay for a solar system, install it on the home for little or nothing, and pay for its maintenance. In turn, the homeowner pays them for the power used.These arrangements are not available everywhere, but it’s certainly worth investigating whether you can find a solar service provider in your neck of the woods who can boost the perceived value of the home. Like custom built-ins, dedicating a space to a particular favorite activity is a special luxury, even if the home is not otherwise especially luxurious. The idea here is to simply dedicate a space to an activity, painting it, installing the appropriate furniture and carving out a place for all the supplies that are involved in that activity. There are currently 69 Active Single Family Homes in the Rye City Schools area. Current Average Price is $3,353,051. Price per Square Foot is $ 706.63. Current Average DOM is 89 days. There are currently 131 Active Single Family Homes in the Harrison Schools area (10580, 10577, 10528). Current Average Price is $2,741,251. Price per Square Foot is $ 456.68. Current Average DOM is 140 days. What is different from offerings of other real estate companies? 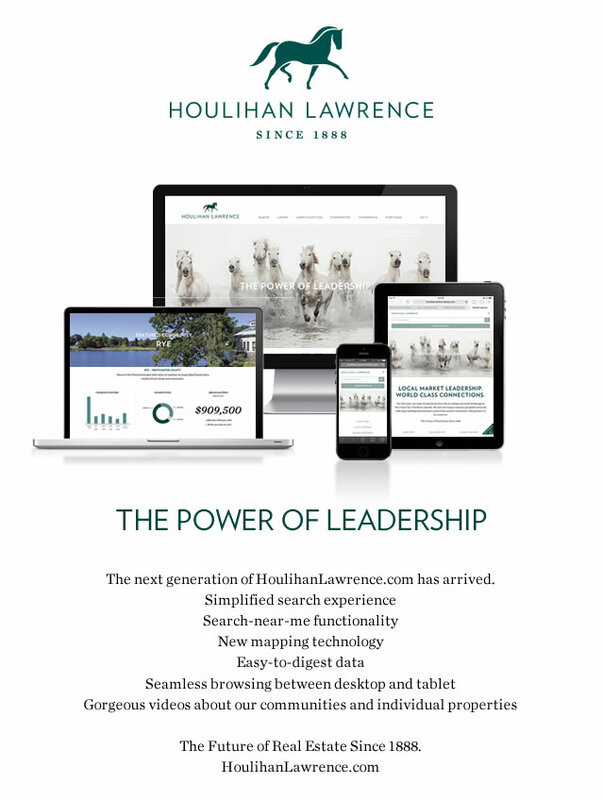 Houlihan Lawrence’s dominance in the marketplace allows us to study the local buyer more thoroughly than our competition. We know where the buyers come from. So we know how to reach them. We have determined that they have certain concerns that we speak to in order to make them educated and prepared for the buying decision. We have also studied their aspirations and have used that knowledge to help us present homes in a way that speaks to their hopes and dreams. What do you think is the biggest benefit for the HL Seller or Buyer? The biggest benefit is our unique data availability. We have complete statistics, and our agents have the knowledge, to teach our clients about the market and make them educated about it so they are ready to buy when the right proposition becomes available. Is the desktop/tablet function a big differential? It certainly is, which anyone who has tried to access a website that is not modified for use on tablet or phone will attest. REAL Trends/The Wall Street Journal “Top Thousand” is a prestigious national awards ranking sponsored annually by the aforementioned publications. This awards program is the leading source of analysis and information for the residential real estate brokerage industry. Joan ranked 160 – landing her in the top 16% nationwide. To put Joan’s expertise to work for you, contact Joan at jomeara@houlihanlawrence.com for a complimentary market analysis of your home. Beautifully converted carriage house on 1.36 acres with fabulous pool. Conveniently located near downtown Rye. 3,540 square feet, 5 bedrooms, 4 bathrooms and 1 powder room. Recently Reduced to $1,750,000. There are currently 70 Active Single Family Homes in the Rye City Schools area. Current Average Price is $3,170,836. Price per Square Foot is $ 691.55. Current Average DOM is 82 days. There are currently 138 Active Single Family Homes in the Harrison Schools area (10580, 10577, 10528). Current Average Price is $2,718,122. Price per Square Foot is $ 458.02. Current Average DOM is 134 days. Unfortunately, it is time to start thinking about fall programs already! Rye’s YMCA Fall Program Guide will be posted online mid- July on the Rye YMCA Website. Registration dates are August 6th for members and August 13th for non-members. Harrison’s Recreation Center will be posting it’s Fall Program Brochure online in the middle of August.